The companion print "Camels on Patrol" is issued with each print in every edition! Robert Taylor�s new aerial masterwork captures perfectly the scenario on that decisive morning in November 1917. 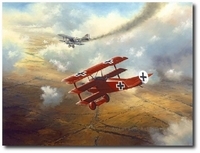 Lt. Powell is seen pumping a deadly burst of machine gun fire into a diving Albatross as the aerial duel wheels and turns in a magnificent skyscape high above Cambrai. Prints of this impressive new painting �The Biff Boys� are issued together with a matching-numbered companion drawing �Camels on Patrol�, signed during his lifetime by famous First World War fighter pilot Henry Botterell. This is an outstanding opportunity for aviation art collectors to share a moment of air combat history that happened almost a century ago. The Artist Proofs also have the main print �The Biff Boys� signed by Henry Allingham, who at age 112 is the oldest surviving combatant from the First World War. The Tribute Proof Portfolio consists of only FIVE copies, and is truly unique in every sense. 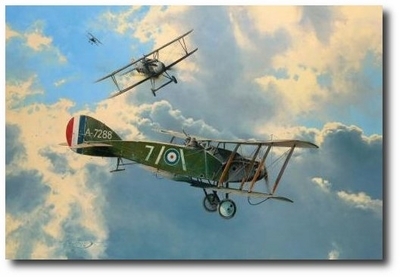 In addition to Henry Allingham�s signature on �The Biff Boys�, and Henry Botterell�s signature on �Camels on Patrol�, a separate special companion print �Close Shave�, solely issued with this portfolio and personally signed by Charles E. Watson RFC, observer/gunner on Bristol Fighters with 11 Squadron during the First World War. It has been conservation matted with the RFC Wings and Blue Max to include the signature of the legendary Manfred von Richthofen.